I admit it, I’m a complete sucker for cinnamon rolls. So much so that as soon as the batch cools, I have to get all but one of these scrumptious delights into the freezer where they’re (relatively) safe until another day. But… sometimes one just isn’t enough. This recipe takes advantage of a food processor for the hard work but I’m sure it would be almost as simple to put together by hand. I originally found this recipe on The Culinary Vampire and have only adapted it slightly. Combine the flour, yeast*, salt, sugar and cold butter in a food processor. Pulse until the butter is ‘rubbed’ into the flour. You should still be able to see bits of butter in the mix. Add the eggs and pulse a few more times. With the machine running, feed the whole milk slowly through the feeder tube. Continue to process for approx 30 seconds. Depending on the dryness of your flour you might need to add more milk. You’ll know the dough is ready when it forms into a ball and is sticky to the touch. Turn the dough onto a floured surface and knead until the dough feels soft and smooth. Form into a ball and place in a bowl. Cover in cling film or a damp cloth and allow to rise to double its size. Rising time is dependent on the ambient temperature but you will need to allow at least an hour. When the dough is ready, transfer to a lightly floured surface and reform into a ball. Cover and let the dough rest for 20 mins. Prepare the baking dish or tray (22cm x 32cm) by brushing with melted butter. To make the filling, combine the cinnamon and sugar in a small bowl. Once the dough has rested, you can roll out to a large rectangle roughly the size of your baking tray. Brush the dough with melted butter (be generous!) then sprinkle the cinnamon mixture over the dough. Leave about a 2cm clear edge on one long side of the rectangle. 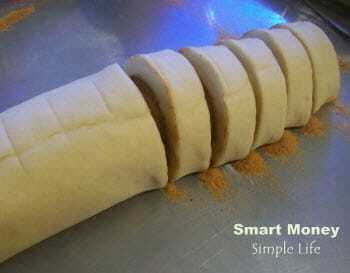 Roll the dough length-wise to create a long ‘log’. Re-position the log so the seam is underneath, then cut into 15 pieces. Place each piece, cut side up, in the prepared tray. Evenly space the pieces in the tray leaving a gap between each piece. Set aside for at least 30 minutes so the rolls can rise again. Pre-heat your oven to 180 degrees Celsius. Set a rack in the middle of the oven. Prepare glaze by combining milk, pure icing sugar and vanilla essence. I use my mini blender (like a Magic Bullet but $20 from Aldi) for this job. Bake the rolls for 30 minutes or until they are nicely browned. Remove from the oven and allow to cool slightly before removing from the tray**. Then drizzle rolls with vanilla glaze. As I mentioned earlier, I freeze the baked cinnamon rolls for another day or sometimes later that day! Just pop the rolls into their own little freezer bag or wrap each separately and place in a container. They are fantastic either thawed to room temperature or you can gently warm them. * It’s always worth testing your yeast for viability by sprinkling some over warm water in which you’ve dissolved some sugar. Allow it to sit for a few minutes, if it foams up it’s ready for use. If it doesn’t, it’s time to ditch that pack and open a new one. ** I prefer to remove the rolls from the pan before icing them because it’s easier to clean up. I place the cooked cinnamon rolls on a cooling rack with newspaper under the rack and pour away! The newspaper catches all the overflow and can then be thrown away.